A handwritten note by Mary Redmond, detailing the wine to be used in the Gala, with brief descriptions of the items and how they would be packaged. These notes also contain projections and information about the prices of wine and how much they would go for at auction. 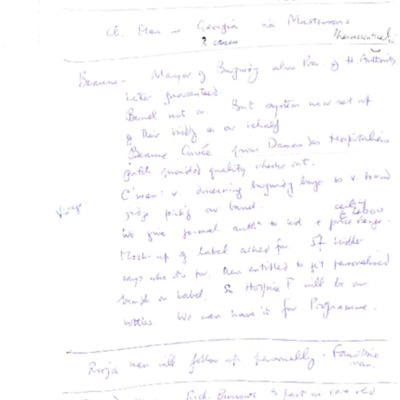 Dr. Mary Redmond, “Handwritten plans for wines used in the Gala.,” Archives Hospice Foundation, accessed April 20, 2019, http://archives.hospicefoundation.ie/document/1894.